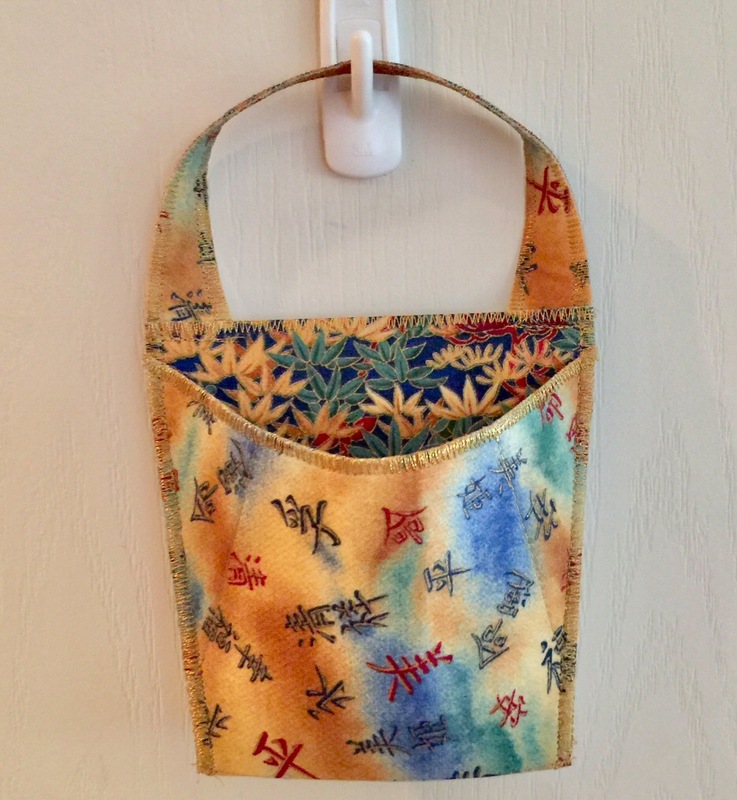 Hang On…I’m trying to catch up with my blog posts on projects I’ve attempted, sewn or completed. In May this year (2017), I stitched up a few “Hang Ons”. 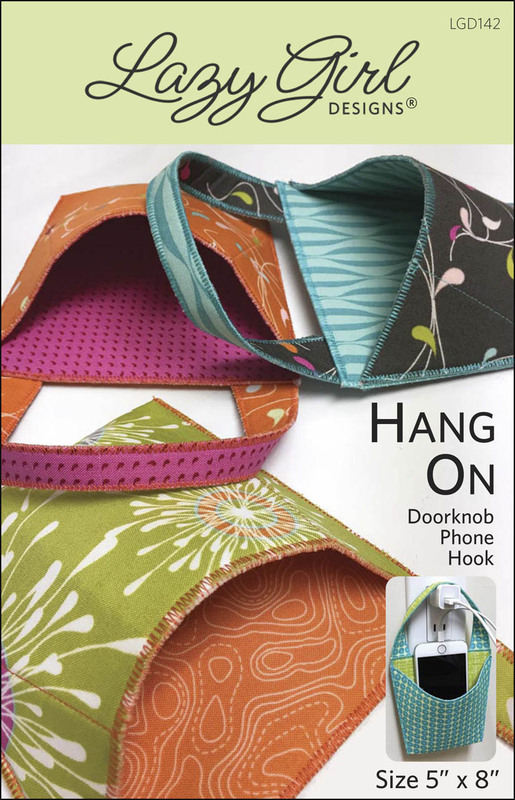 Hang On is a new Lazy Girl Designs sewing pattern, created by Joan Hawley. Hang Ons are little pouch type hanging pockets that are great for holding all sorts of things: tools to cell phones to sweet treats. They make great gifts too! You can hang them on door knobs, drawer pull-knobs, hooks of all types (including Command Hooks™, see pictures below) and even push pins. 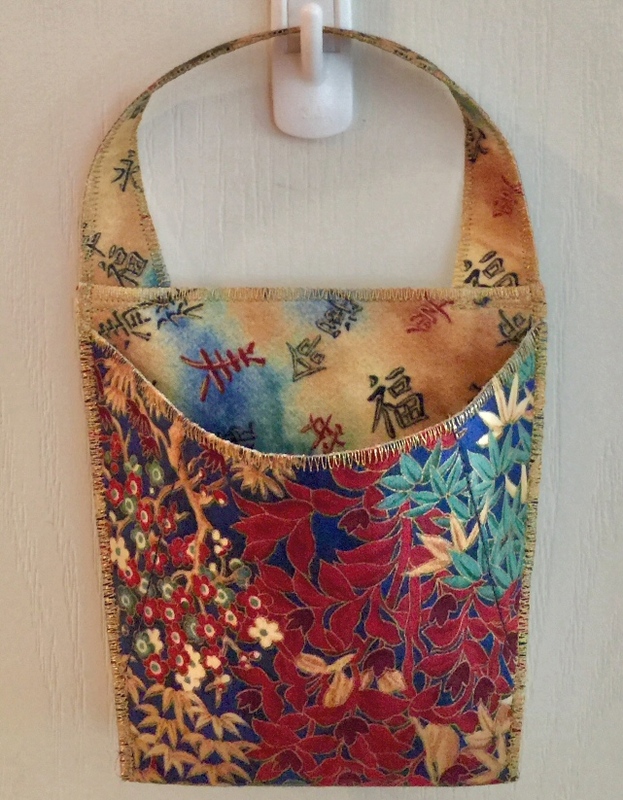 I chose a couple lovely metallic Asian fabrics from my stash. I used Superior Metallic Antique Gold thread to finish the edges. Click the image to view a larger picture with more detail. Notice, I didn’t flip the handle (as indicated by the pattern cover samples). Was it on purpose–a design decision? Or was it my mistake? I’ll never tell. I will say that I do love how this baby turned out. What do you think? This is a fraternal twin sister to my first Hang On. I used the same fabrics, swapped right sides and insides, and on this on I did flip the handle as indicated by the pattern. Again, I used Superior Metallic Antique Gold thread to finish the edges. For my third Hang On, I wanted to experiment with finishing the edges with couching. Again, I chose fabrics from my stash and found some fun, funky yarn to use in couching the edges. If you’ve never experimented with couching fibers by machine, this is the perfect project to give it a try. Click the pic to see larger image and more detail. To couch yarns or fibers, simply stitch them on using a machine zig zag or other decorative stitch. Experiment and have fun. You may choose coordinating or contrasting sewing threads to use in your machine. Many machines have a “couching” foot to help control placement of the fibers. However, I didn’t use one for this project. I love the soft, slubby edges that the yarn provides. I wanted to continue experimenting with couching, so on my fourth Hang On, I also stitched the accent folds with couched yarn (in addition to finishing all the edges with couching — click image for larger picture/more detail). This one reminds me of those beautiful mossy hanging baskets of flowers. She’s a working girl — holding a handful of my favorite sewing tools, keeping my sewing table clean and my tools within reach. Tools shown are: Point2Point Turner, Roll & Press, Superior Snippers, Awl, and Stiletto. 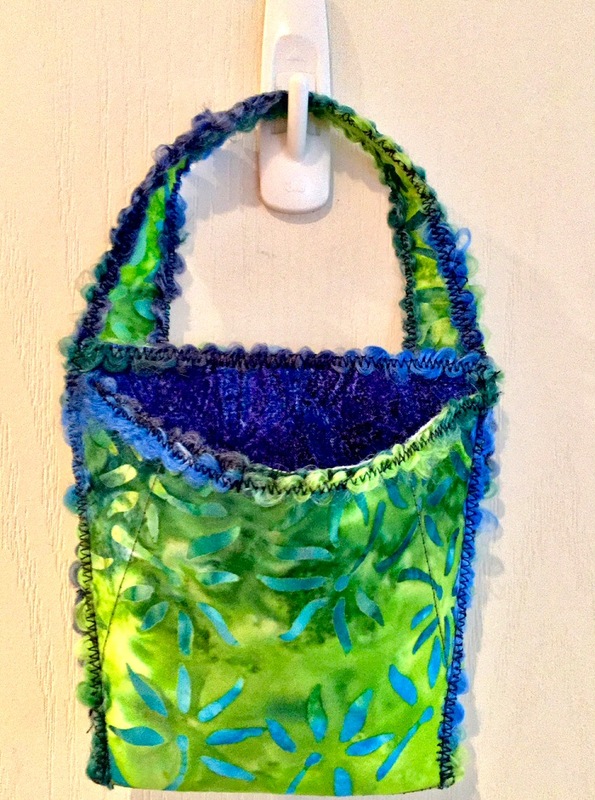 Hang On is a super easy and fun to sew project. It’s a perfect project for beginners or as a first project. It’s also FUN for experienced sewists — can you say instant gratification? 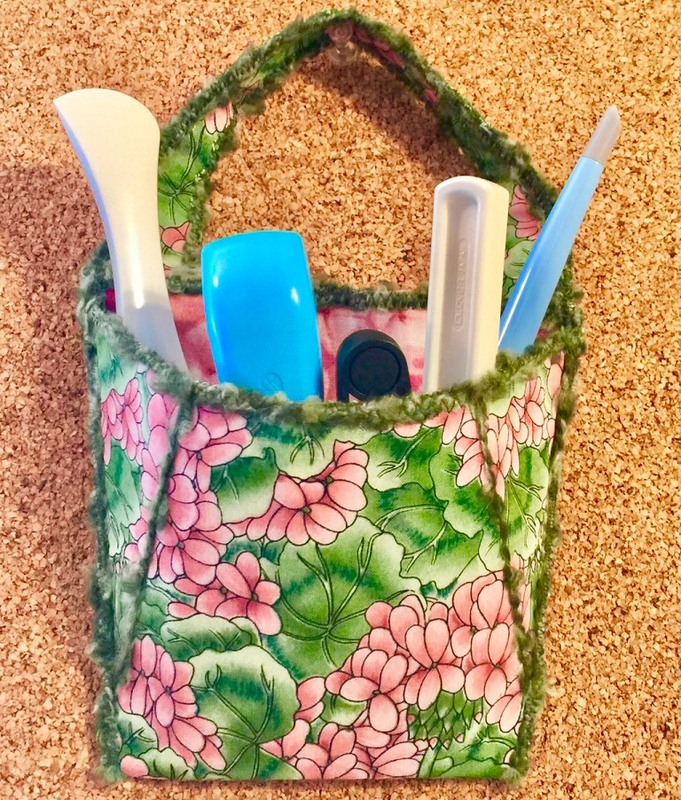 It’s also a great way to use up small pieces of fabrics from your stash. If you don’t have the Hang On sewing pattern yet, you can get it ON SALE NOW: click here to order yours today. Save more money — sew more smiles. NOTE: Stiff Stuff is currently not available from the manufacturer and all our suppliers have sold out. It is expected to be back in stock in mid to end of October 2017. Until then, I recommend substituting Soft & Stable. 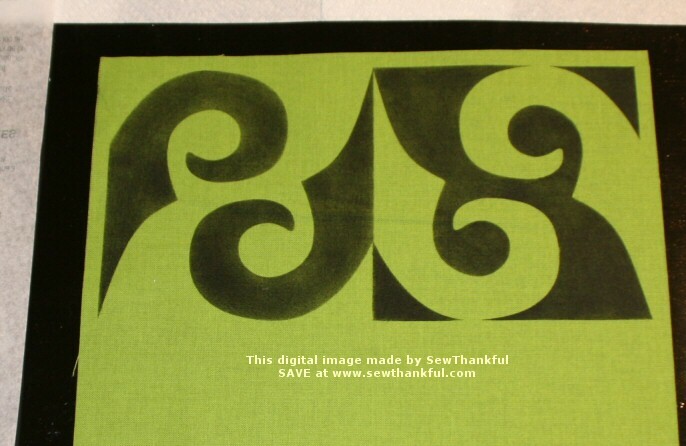 Are you a subscriber to the SewThankful eNews? 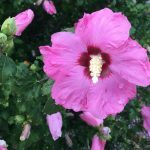 Our eNews is the main place I make new product and special sales announcements, provide special eCoupon codes, share ideas (or sometimes recipes), offer encouragement, etc. If you’re not a current subscriber you can take a look at what your missing this week…just click here. If you’d like to subscribe, click here. 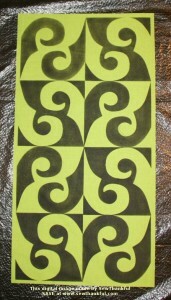 Stenciled the lime green center panel first using black Shiva Paintstiks. Stitched the narrow panels of black fabric to each side of the center panel. Added a narrow black border all around. This is a small (approx. 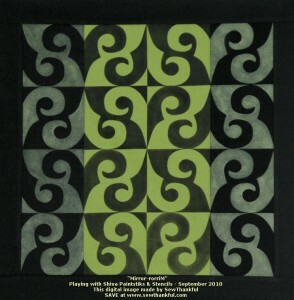 20″ x 20″), contemporary wall quilt (top only so far). Notice how the design flips on the sides? I don’t tend to feel comfortable (it’s not natural for me) to be working in contemporary design so this project has been an excellent exercise for me. These colors are also not my usual choices, but I like the piece quite a lot so far. 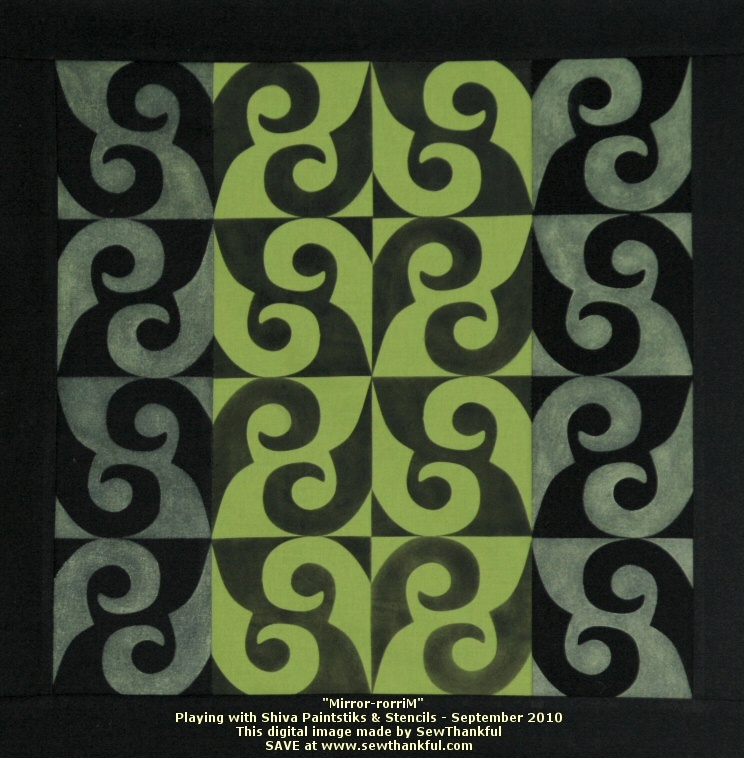 Still need to determine the quilting design…any ideas anyone? 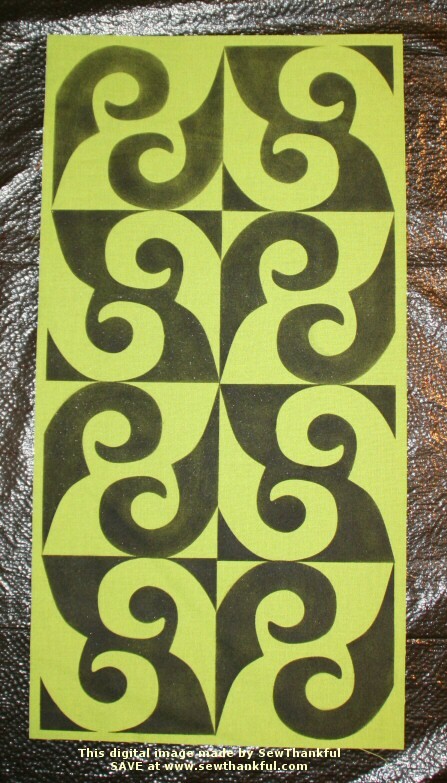 Wish I had more time to play right now–I had SO much fun using Paintstiks and DesignMagic Stencils. 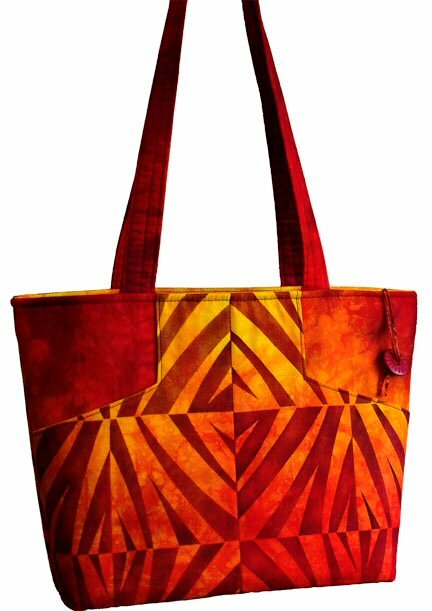 Have you seen Shelly Stokes’ stunning Margo Bag? Question: What do you get when Shelly Stokes combines Safari Design Magic Stencils, Paintstiks & the Lazy Girl Margo pattern? 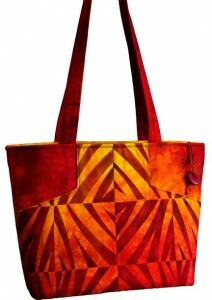 Answer: This simply spectacular, stunning Margo Bag. 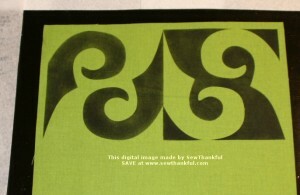 Click here to read Shelly’s review of Margo and more about Design Magic book & Design Magic Safari stencils on the Cedar Canyon Textiles blog. I’ve been yearning to break out my Shiva Paintstiks for a long time; even before Shelly Stoke’s book, Design Magic was released. But once I had a chance to read through the book I just couldn’t take it anymore and finally MADE the time this afternoon/evening. Shelly’s instructions make the techniques very easy to achieve. And the book has a ton of tips, ideas and information. BUT…it took me a while to decide on the colors I wanted to work with (both fabric and Paintstik). And more time to decide on the project (and which stencil) I wanted to make. I have a love/hate relationship with the selection process. It feels like wasting time that I could be using to work on the project, but I haven’t been able to figure out a way to speed up the process. I need to feel satisfied with the selections before my mind allows me to do the work. Do you ever have that problem when working on projects? It was like being a kid in candy store, I swear. I have so much trouble deciding because I want one of everything! 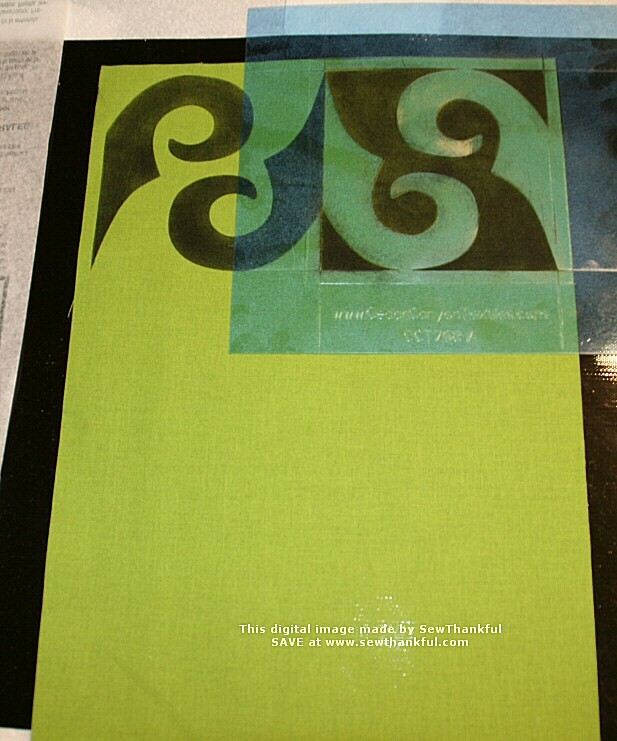 In the end, I selected a project from the Design Magic book and decided on the Design Magic Scroll Stencil. But, I never seem to be able to follow a project exactly, so I’m altering it to suit my own inner artist. I am TOTALLY loving the Design Magic technique using stencils & brushes. My must have tools while working with Paintstiks include: Grip-n-Grip Mat, Palette Paper (or parchment paper), 404 Spray Fix or other fabric safe temporary spray adhesive OR painter’s tape to secure the stencil while working, and a roll of paper towels. This is the first time I tried using the longer, softer 1/2′ brush and I have been extremely impressed with the results. The paint seems to spread in a softer, smoother manner than when I’ve tried the short/harder bristled brushes in the past. Of course, it could have been my lack of experience that produced the more ‘brush marked’ results. The older I get, the more I discover there really is no short cut for practice and experience. Reading tips and instructions help a great deal, but actually doing the work is what makes the difference over the long term. 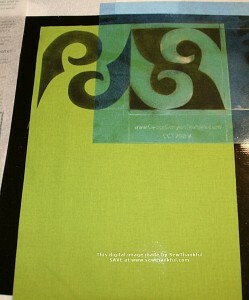 Lift the stencil away and watch the design appear...like magic! The first/main panel of my project is complete! I *LOVE, LOVE, LOVE* the striking graphic look of this panel. I wish I could stay working on this all night… Alas, I have other (family & business) deadlines to meet before I may continue. Stay tuned for my progress and more pictures this weekend and next week.